Students often struggle with questions on waves, particularly when they ask about the differences between longitudinal and transverse waves. This question asks you to choose which of the options is a longitudinal wave, but it’s important for students to understand what waves actually are as well. A leaf will stay still even as ripples (transverse waves) pass under it. Waves transfer energy without transferring matter. That means that as energy is passed through a material (or ‘medium’) such as air or water, the particles move back and forth - they vibrate around a point. You’ll have seen waves such as ripples moving across the surface of a pond. The water is rising and falling (oscillating), but not moving along - you’ll notice that if a leaf is floating on the surface it stays still, even though the wave moves under it. The wave shape moves along, but the water itself stays in place - the wave is transferring energy without moving matter. There are two kinds of wave, longitudinal and transverse, and the difference between them is the direction that the particles oscillate compared to the direction that the wave moves. When a transverse wave moves along, the particles are moving up and down (perpendicular). Tranverse just means ‘across’. In contrast, when a longitudinal wave moves along, the particles are oscillating in the same direction as the wave - back and forth. Think “longitudinal is along”. So how are the particles moving, yet not moving? The particles oscillate around a rest position - so they vibrate back and forth around a specific point. The rest position is the position which the particles started at, and which they return to when they stop vibrating. This is why we say that the particles (and therefore matter) don’t move, even though they aren’t completely stationary - the displacement of a particle in a wave is zero. Transverse waves are the type of wave which probably immediately spring to mind - waves at the beach, ripples in a pond or the crack of a whip. As the particles move up and down, the energy is transferred sideways, creating an S shape. This is because the particles are oscillating perpendicular to the direction of travel and energy transfer. A longitudinal wave, here shown as a spring, has areas of compression and rarefaction. These are the other types of waves, where the particles move side to side, parallel to the direction of travel and energy transfer. A good way to visualise this is with a spring which has been stretched out - as one end is compressed, the wave goes along the spring, with particles compressing and then stretching out again. 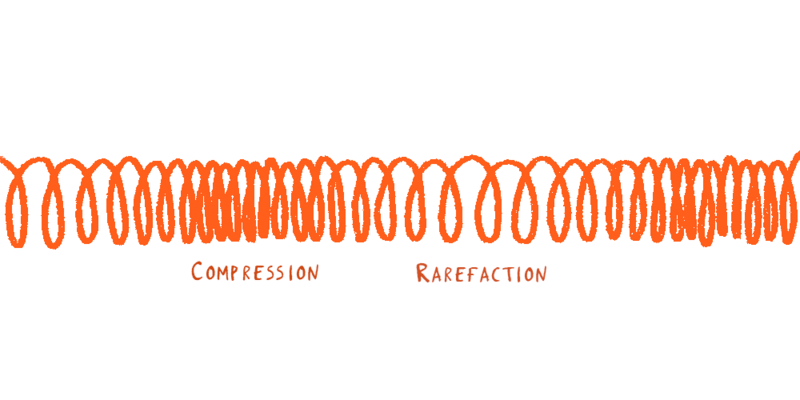 Longitudinal waves show areas of “compression” and “rarefaction”. Areas of compression are the areas where particles are close together - they are compressed. Areas of rarefaction are the areas where the particles are spread out, and the distance between them is greater than when they are compressed. At the very start of this blog post ripples on a pond were given as an example of transverse waves, so we know that the answer is not A - and this also means it cannot be B. Similarly, a whip crack is also a transverse wave - this is because in both a ripple and a whip the wave is moving up and down while the energy is being transferred sideways. Therefore we know the correct answer is D - the movement of the rungs of a spring as it bounces. This is because the particles of the wave are moving in the same direction as the energy transfer.